Dice Apple. I left the skin on but you could take it off. 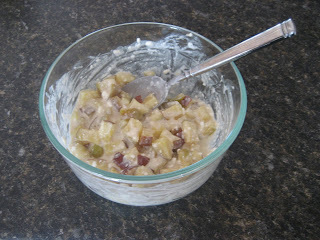 In a microwave safe bowl mix apple, cinnamon, and sweetener. Microwave for 1 minute 30 seconds. Remove from micro and immediately stir in cottage cheese. Enjoy. I will try it, but is the cottage cheese taste really prominent? No not really at all! Its really good and does taste like apple pie!